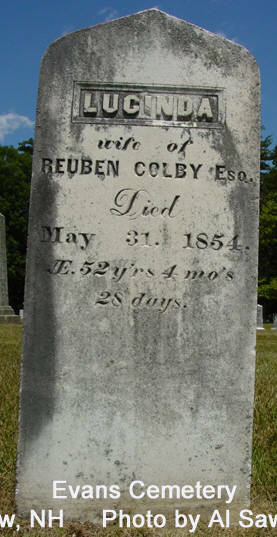 COLBY FAMILY & OTHERS, at http://freepages.genealogy.rootsweb.com/~colby/colbyfamciting FHL Number 1000976; Marriage: Lucinda COLBY, Date: 22 Mar 1821; Recorded in: Birth and Marriage Index for New Hampshire. "New Hampshire, Marriage Records, 1637-1947," index and images, FamilySearch (https://familysearch.org/pal:/MM9.1.1/FLXW-RG9 : accessed 15 Dec 2012), Henry J. Tirrell and Lucretia P. Colby and null, 1850. "New Hampshire, Marriage Records, 1637-1947," index and images, FamilySearch (https://familysearch.org/pal:/MM9.1.1/FLXW-R6Y : accessed 15 Dec 2012), Henry J. Tirrell in entry for George H. Tirrell and Georgie Clark and null, 1879. Harrison Colby, A genealogy of the descendants of Abraham Colby and Elizabeth Blaisdell, his wife, who settled in Bow in 1768, , at https://archive.org/details/genealogyofdesce00colb . Concord, N.H.: Printed by the Republican Press Association, (1895) Microfilm #896944 of the Family History Library, Salt Lake City, Utah, pp. 51-2. "United States Census, 1860", database with images, FamilySearch (https://familysearch.org/ark:/61903/1:1:MCW5-VDD : accessed 2 April 2016), Lucy Colby in entry for P W Colby, 1860. "United States Census, 1860", database with images, FamilySearch (https://familysearch.org/ark:/61903/1:1:MCW5-VD4 : 30 December 2015), P W Colby, 1860. Massachusetts Vital Records, 1841-1910, , Vol: 146 ; Page: 118. 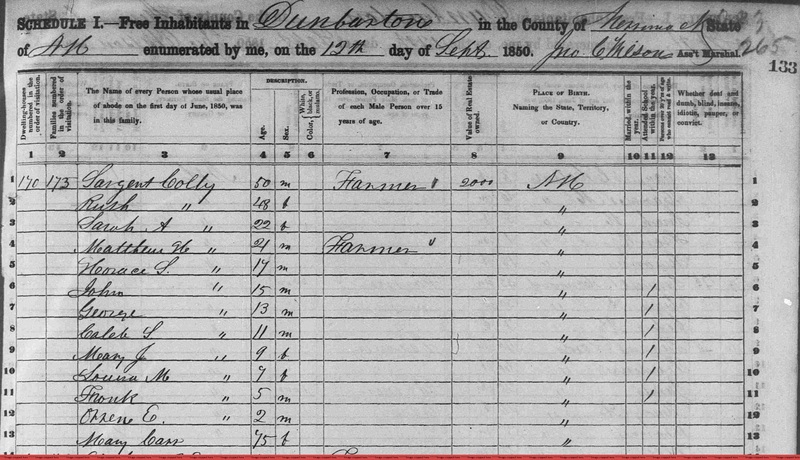 "United States Census, 1870," database with images, FamilySearch (https://familysearch.org/pal:/MM9.3.1/TH-267-12043-66129-51?cc=1438024 : 22 May 2014), Massachusetts > Hampden > Springfield, ward 5 > image 77 of 92; citing NARA microfilm publication M593 (Washington, D.C.: National Archives and Records Administration, n.d.). Massachusetts Vital Records, 1841-1910, , Vol: 93 ; Page: 337. Lucy Perkins Colby was born perhaps about 1805. Harrison Colby, A genealogy of the descendants of Abraham Colby and Elizabeth Blaisdell, his wife, who settled in Bow in 1768, , at https://archive.org/details/genealogyofdesce00colb . Concord, N.H.: Printed by the Republican Press Association, (1895) Microfilm #896944 of the Family History Library, Salt Lake City, Utah, p. 111. COLBY FAMILY & OTHERS at http://freepages.genealogy.rootsweb.com/~colby/colbyfam, /d168.html. Harrison Colby, A genealogy of the descendants of Abraham Colby and Elizabeth Blaisdell, his wife, who settled in Bow in 1768, , at https://archive.org/details/genealogyofdesce00colb . Concord, N.H.: Printed by the Republican Press Association, (1895) Microfilm #896944 of the Family History Library, Salt Lake City, Utah, p.137. 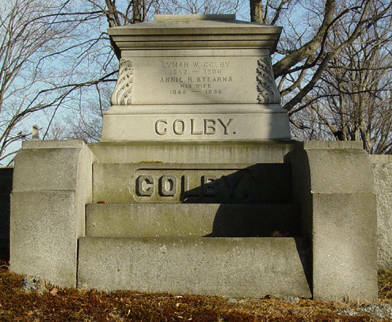 COLBY FAMILY & OTHERS at http://freepages.genealogy.rootsweb.com/~colby/colbyfam, /d169.html. living at Hollywood Avenue, Los Angeles, Los Angeles County, California. "Wisconsin, Marriages, 1836-1930," index, FamilySearch (https://familysearch.org/pal:/MM9.1.1/XRL5-3DW : accessed 21 Nov 2012), Walter C. White and Mabel Lilliane Colby, 23 Aug 1896. 1900 United States. Census Office. 12th census, 1900 population census schedules, Washington, District of Columbia: Bureau of the Census Micro-Film Laboratory, ([197-]) , Census Place: Clifton, Pierce, Wisconsin; Roll: 1811; Page: 4A; Enumeration District: 0100; FHL microfilm: 1241811. 1910 United States. Bureau of the Census. 13th census, 1910 population census schedules, Washington, District of Columbia: Bureau of Census Micro-Film Lab, ([19--?]) , Census Place: Los Angeles Assembly District 74, Los Angeles, California; Roll: T624_84; Page: 16B; Enumeration District: 0074; ; FHL microfilm: 1374097. 1920 United States. Bureau of the Census. 14th census, 1920 population census schedules, Washington, District of Columbia: The National Archives, ([193-?]) , Census Place: Los Angeles Assembly District 73, Los Angeles, California; Roll: T625_114; Page: 6A; Enumeration District: 403; Image: 390. 1930 United States. Bureau of the Census. 15th census, United States, 1930 federal census : population schedules ; NARA microfilm publication T626, Washington, District of Columbia: Bureau of the Census Micro-Film Laboratory, ([19--?]) , Census Place: Fresno, Fresno, California; Roll: 117; Page: 1B; Enumeration District: 50; Image: 435.0; FHL microfilm: 2339852. Sixteenth Census of the United States, 1940, Washington, D.C.: National Archives and Records Administration, (1940) , Census Place: , Fresno, California; Roll: T627_202; Page: 17A; Enumeration District: 10-71. 1850 United States. Census Office. 7th census, Population schedules of the seventh census of the United States, 1850, Washington, District of Columbia: National Archives. Central Plains Region, (1964) , Census Place: Manchester, Hillsborough, New Hampshire; Roll: M432_432; Page: 88A; Image: 182.